A common theme in mythology and related fiction is that of the sea voyage that includes a visit to a bunch of weird islands with bizarre people and creatures. This sort of thing can also happen in stories of overland journeys, but islands are insular by definition, so it makes sense that they’d have their own cultures and little interaction with the outside world. The Odyssey might be the most famous example of this, with Odysseus visiting strange islands, encountering monsters and other supernatural beings, visiting the world of the dead, and finally returning back home after losing his crew. In medieval Ireland, there was a popular genre known as the immram, which involved a sea voyage of a spiritual nature. The name literally means “rowing out,” and it was heavily influenced by the earlier echtrae, a voyage to the Otherworld in pagan tradition. Immrama are specifically Christian, although there are definitely elements of earlier Irish mythology. Whether the immrama are specifically inspired by the Odyssey and similar Greek stories isn’t entirely clear, but there are some obvious similarities. There are some borderline cases, like the Voyage of Bran, or Immram Brain, which sounds like a mental condition. It was originally pagan, and the sea god Manannan mac Leir appears as a character, but it has had Christian interpretations. When Bran mac Feabhail (not the same as Bran the Blessed, although he also seems to be of royal blood) hears from a woman about a magical land of peace, happiness, and plenty, as well as chariot and boat races. When Bran sets off across the sea with a crew led by his foster brothers, he first arrives at the Isle of Joy, where the inhabitants just stand around and laugh, and when one of Bran’s men goes ashore he begins doing the same. Then they reach the Land of Women, where Bran is ensnared in magic thread and he and his crew brought to land. They remain there in a dreamlike state for what seems to them to be a year, but due to time flowing differently, many years pass. They return to Ireland, where one of them jumps to shore and turns to ash, similar to the story of Oisin’s stay in Tir na n’Og. The others tell their story and then go back to the sea and are never seen again. The story of St. Brendan, the oldest written version of which dates to around 900, has some similar themes. After hearing from another cleric about a visit to Paradise, Brendan sets out to sea with a crew of monks, coming to various islands with spiritual meanings, including one inhabited solely by a dog, and another where birds sing hymns. They also come across a rock where Judas is given reprieve from Hell on Sundays and holy days, are saved from a sea monster when God sends another one to kill it, see a giant bird fight a griffin, and spend Easter on the back of a whale that moves when they light a fire. The whale is identified as Jasconius, the world’s biggest sea creature, who unsuccessfully tries to put his tail in his mouth. I guess he figures that, if Jormungand could do it, so could he. The story of Sinbad also has him landing on a whale he thinks is an island, and it also moves when he lights a fire on it. After years of travel, they reach Paradise, an island surrounded by mists where they find a lot of fruit trees and a river they’re not allowed to cross. 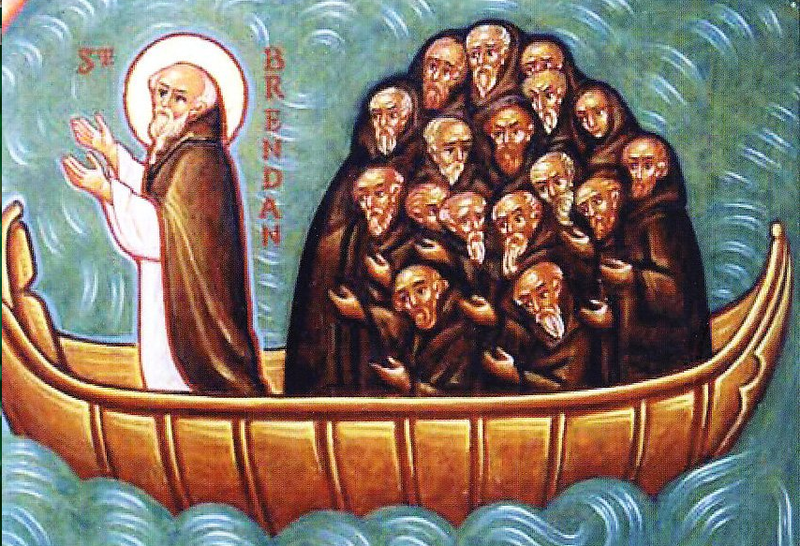 St. Brendan the Navigator is believed to be a historical figure who lived from the late fifth through early sixth centuries and founded several monasteries in his native Ireland, but accounts of his life seem to mix fact and fiction. Other people later claimed to have seen the island of Paradise that Brendan discovered, and it appeared on some maps. There’s even a theory (the popular kind, not the scientific one) that Brendan reached North America. The Voyage of Mael Duin seems to date back to around the eighth century. Unlike the two previous explorers, he isn’t voyaging to find an earthly paradise, but to avenge his father. It’s kind of weird because not only did he never know his father, the warrior Ailill Ochar Aghra, but Ailill raped his mother. But he’s intent on it, and sails out to some familiar places, including the island of laughing people who make anyone who lands there one of them and one with women who make the visitors stay longer than they want. And while a member of Brendan’s crew steals from the island inhabited just by a dog and is possessed by a devil, here it’s an island with a cat that jumps right through the thief and burns him to ashes. Other islands include one with giant ants, one with a creature like a horse with the legs of a dog that wants to eat the sailors, one where salmon fall out of a stream that flows through the air, one with fire creatures, and one where the sheep change color when crossing the land. The crew decides not to land there for fear they’ll change color, which sounds kind of racist. But my personal favorite discovery is a beast that turns around by moving its bones and muscles around inside its skin. Finally, they visit an old hermit who receives food from an otter, who advises Mael Duin to forgive his father’s murderer, which he does upon his return to Ireland. I’ve been reading about different translations of Final Fantasy VI on Legends of Localization, and it came up that the Esper Maduin, father of Terra Branford, is generally thought to have been named after Mael Duin. I don’t know that there’s any real connection between this character and the one from the immram, but the hidden land of the Espers does bear some similarity to the Irish Otherworld. 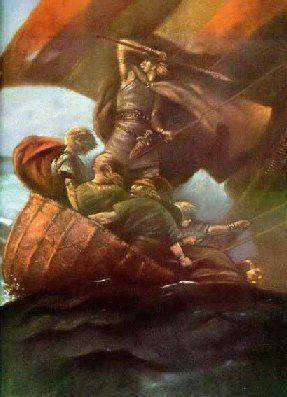 As indicated in this review of The Voyage of the Dawn Treader, this book is heavily inspired by the immrama, centered around a voyage to Aslan’s Country and stopping on multiple weird islands, including one where a fallen star in the form of an old man rules over one-legged people, and another with a table holding a holy relic and surrounded by people in an enchanted sleep. There’s also a clear sea, something found in the stories of Brendan and Mael Duin. 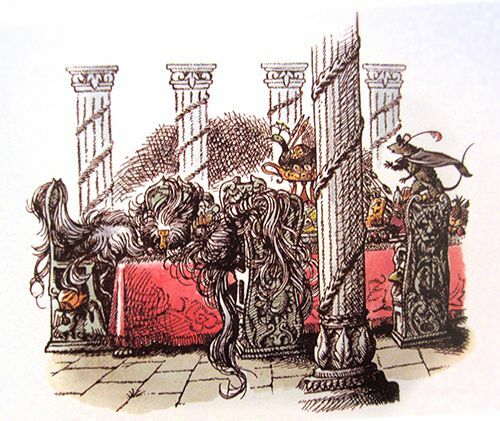 Aslan’s Country is located at the eastern edge of the Narnian world, and everyone but Reepicheep only gets a glimpse of it. And he goes there in a coracle, a sort of boat often used in the immrama. This entry was posted in Authors, C.S. Lewis, Catholicism, Celtic, Christianity, Chronicles of Narnia, Conspiracy Theories, Final Fantasy, Greek Mythology, Maps, Monsters, Mythology, Poetry, Religion, Video Games and tagged ailill ochar aghra, aslan's country, bran mac feabhail, echtrae, espers, final fantasy vi, griffins, heaven, immram brain, immrama, isle of joy, jasconius, judas iscariot, land of women, maduin, mael duin, manannan mac leir, odysseus, odyssey, oisin, otherworld, paradise, reepicheep, sinbad, st. brendan the navigator, terra branford, tir na nog, voyage of bran, voyage of mael duin. Bookmark the permalink.